I have been researching and writing about new religious movements (NRMs) ever since I unwittingly chose a new religions topic for my dissertation: the lifelong evolving millennial thought of the Englishwoman Annie Besant (1847–1933) who lived in India while serving as the second president of the Theosophical Society and carrying out numerous projects for social, educational, political, and religious uplift and reform. I have been teaching at Loyola University New Orleans for more years than I care to tell my students. There I have taught numerous sections of the course “Religions of the World.” I also teach “Women in World Religions,” “Women in Christianity,” as well as courses on Asian religions, millennialism, and New Orleans religions. I have been integrating what I have learned in new religions studies into these courses. The study of new or alternative religions is not an area separate from the general study of religions. Analysis, categories, issues, and information from new religions studies are relevant to diverse religious studies courses in addition to courses devoted specifically to NRMs. New religions studies sheds light on manifestations of charisma, the routinization of charisma into institutionally authorized forms of leadership, and varieties of millennialism. Important issues examined in new religions studies that are relevant to the study of religions more broadly include the maturation processes of new movements, canon formation, gender, roles of women, women’s religious leadership and the factors that support it, the dynamics of religious violence, and the connection of many violent episodes with millennial worldviews. I will discuss briefly some approaches I have taken in “Religions of the World” and my courses on women in religions based on my study of new religious movements. New religions studies is relevant in the “Religions of the World” course well beyond the now obligatory chapter on NRMs in world religions textbooks. Analytical categories and data derived from new religions studies are congruent with promoting students’ religious literacy, which enables them to understand religious traditions that shape our world, critically evaluate information about religions, and be informed citizens knowledgeable about religious groups and movements reported in the news. In addition to discussion of “charisma”—which I define as followers’ belief that a leader, text, or place has access to an unseen source of authority—I introduce my students to the types of millennialism that frequently manifest in the world’s religions. My study of NRMs indicated the need to develop a definition of millennialism built on, but also going beyond, the classic definition given by Norman Cohn in The Pursuit of the Millennium (1970). Therefore, I define “millennialism” as the expectation of an imminent transition to a collective salvation, either on Earth or in heaven or both, which may be effected by superhuman intervention or by humans exerting effort according to what they regard as a sacred plan. Millennial ideas frequently motivate the founding of NRMs, some of which may grow to become dominant religious traditions (as did Christianity and Islam). I introduce my students to the categories of “catastrophic millennialism” and “progressive millennialism,” which I developed to expand the old categories of premillennialism and postmillennialism beyond their rootedness in Christian theology. Catastrophic millennialism is the belief that an imminent transition to a collective salvation involves the catastrophic destruction of the old order. Progressive millennialism is belief in progress and that humans working according to a divine or superhuman plan can imminently create a collective salvation. I stress that catastrophic millennialism and progressive millennialism are not mutually exclusive; believers may combine traits of each or shift from one to the other in response to events. The study of NRMs demonstrates that messianism is frequently associated with catastrophic millennialism and progressive millennialism, but it is not a necessary feature of either. Contrary to my assumption when I first started studying about millennialism and violence, not all progressive millennialists rely on benevolent social work to create the millennial salvation on Earth. As shown in chapters in Millennialism, Persecution, and Violence (Wessinger 2000), some progressive millennialists, for example the German Nazis, Maoists, and the Khmer Rouge, resort to force or violence to remove anyone perceived as standing in the way of their desired collective salvation for the designated elect. I also introduce my students to the category of nativist millennial movements, which may take catastrophic or progressive manifestations. Nativist millennialists are responding to the destruction of their traditional way of life and removal from their sacred land, and they hope for a collective salvation that restores their idealized past way of life. There is also “avertive apocalypticism,” which motivates believers to take steps to avert feared imminent apocalyptic destruction. They may resort to religious practices, as do the followers of the Marian apparition messages received by Veronica Lueken (1923–1995) in Bayside, New York, who dedicate themselves to renewing their traditional Catholic faith, personal penance, praying the rosary, and attending Masses to avert God’s chastisement of humanity. David Redles (2011) argues in his chapter on “National Socialist Millennialism” in The Oxford Handbook of Millennialism that the Nazis carried out the “final solution” as the means of averting what they believed was imminent apocalyptic destruction of the German race by a Jewish plot. Given the continued influence of The Protocols of the Elders of Zion in the world today, it is important to educate students that this text is spurious. Study of the types of millennial movements and the dynamics of millennial groups that use violence is directly relevant to understanding historical and current events. Millennial groups involved in violence may be assaulted. They may initiate violence because of fragility caused by stresses internal to the group and pressures applied from outside. They may be revolutionary. On the revolutionary end of the millennial spectrum there is convergence between catastrophic millennialism and progressive millennialism because both types of adherents possess extreme dualistic worldviews that dehumanize perceived opponents. Today’s students are perplexed by the violent conflicts involving Islamic movements. I find that even Muslim students do not know the meaning of the term “Islamist” used in the news. I emphasize the difference between ordinary faithful Muslims, and Islamists (moderate or radical) who want to create an Islamic state that enforces their understanding of sharia. The Islamist goal is a millennial one. Jeffrey T. Kenney gives an excellent overview of the goal and diverse methods of Islamists in his chapter, “Millennialism and Radical Islamist Movements,” in The Oxford Handbook of Millennialism. Radical Islamist millennialism is very much in evidence in the current military drive of the Islamic State in Iraq and the Levant, which on June 29, 2014, announced it had established a caliphate that should be known as the Islamic State and its leader should be known as Caliph Ibrahim. Today’s students were also born after the conflict between federal agents and the Branch Davidians in 1993 that caused the deaths of four Bureau of Alcohol, Tobacco, and Firearms (BATF) agents and 82 Branch Davidians including 22 children. This incident represents the largest loss of life in law enforcement action in the United States. The tank and gas assault of the Branch Davidian residence on April 19, 1993, by Federal Bureau of Investigation (FBI) agents is the largest use of CS gas—which is intended for outdoor crowd dispersal—in an enclosed space. In “Religions of the World,” I acquaint students with this case and encourage them to use it to think critically about the implications of a religious group being labeled a “cult” by the state and about the types of interactions with religious believers that contribute to a violent outcome. I assign my short profile of the Branch Davidians on the World Religions and Spirituality Project (WRSP) website. In class I show and narrate a PowerPoint slide show (also available on the WRSP website) of photos of Branch Davidians, their residence, and the BATF and FBI assaults. In the future I will also assign a short paper I presented at the 2014 Center for Studies on New Religions (CESNUR) meeting, “The Siege of the Branch Davidians’ Mount Carmel Center according to the FBI” (also available at my academia.edu page), which discusses findings in the internal FBI logs and memos concerning the case. These documents reveal that FBI decision makers were well informed of the Branch Davidians’ apocalyptic theology of martyrdom when the tank and CS gas assault was planned and implemented. For students wanting more information, I have an extended profile on the Branch Davidians on the WRSP website and academia.edu. New religions frequently provide social spaces for experimentation with alternative theologies supportive of women’s empowerment, women’s religious leadership, and broadened gender roles. But they have also been spaces where patriarchal roles are promoted and enforced with the typical abuses that arise in such contexts. Assigning and discussing materials about women in new religions increases understanding of the variety of roles that women can claim in religions in general. The study of new religions, as well as dominant religious traditions, demonstrates the ways that gender roles and religious beliefs are interrelated and affect one another. Studying about women in new religions elucidates types of women’s leadership roles and theologies that are now being incorporated into mainstream religious traditions. Learning about women’s creativity and efforts for equality in NRMs sheds light on women’s struggles for equality and changing gender roles in mainstream religious institutions. When I began teaching about women in religions, I was interested in exploring with students the characteristics supportive of women’s religious leadership. I assigned Mary Farrell Bednarowski’s 1980 article, “Outside the Mainstream: Women’s Religion and Women Religious Leaders in Nineteenth-century America.” After comparing the Shakers, Spiritualism, Christian Science, and Theosophy, Bednarowski concludes that women achieved leadership positions and status equal to men in new religions that (1) deemphasized the masculine deity either by stressing an androgynous deity, a female deity, or an impersonal ultimate principle; (2) reinterpreted or denied the doctrine of the Fall (blamed on Eve); (2) had forms of leadership alternative to an ordained clergy; and (3) had views of gender that did not stress marriage and motherhood as the only roles for women. By reading and discussing chapters in Women’s Leadership in Marginal Religions, students come to a variety of conclusions concerning women in religions more broadly. They discover that a female deity—or deities in themselves—do not necessarily result in broadened gender roles for women in society and religion. As Marjorie Procter-Smith writes in her chapter on the Shakers, “a female deity or image of the divine being is empowering to women only insofar as it remains independent of and critical of existing patriarchal social structures and experiences” (36). Students find that women have participated in leadership roles or even founded new religions that are not reliant on ordained clergy. They learn that when there is an increased social expectation of equality, and therefore a view of gender that does not restrict women solely to the roles of wife and mother, new religions may develop ordained leadership roles open to women. Parallel to the centuries of strategies of male religious leaders in patriarchal religions, women leaders in new religions frequently strive to legitimate their religious leadership by highlighting significant foremothers and a feminine aspect to the Divine. Women religious leaders may also promote belief in a nongendered ultimate reality. As lessons from the study of women in NRMs are applied to mainstream religious institutions, students discover that if the religion does not admit women into its leadership roles as the social expectation of equality increases, women begin to demand admission to institutional forms of leadership. If the religion does not yet have a theology that stresses alternatives to the patriarchal male deity, women leaders will begin to introduce alternative conceptions of deity. If the religion has a mythology that has been used to justify subordination of women, women intellectuals and leaders will offer rationales to reject or reinterpret that myth and the doctrines based on it. Students also learn that feminist women have cultivated new religious movements, such as the Women-Church movement and Wicca, in which religious leadership is shared. Students learn that men choose to participate in religions strongly shaped by women and that emphasize female deities. All of these developments in a number of NRMs foreshadow similar developments occurring in mainstream religious institutions that are open to change. The first three volumes in the Women in Religions series at New York University Press, written for use in courses, will be published in spring 2015. Barbara R. Ambros in Women in Japanese Religions and Rebecca Moore in Women in Christian Traditions examine women in new religious movements as well as mainstream religious cultures. They assume that women’s roles in all religious groups and movements are worthy of study. Laura Vance in Women in New Religions examines primarily women in the Church of Jesus Christ of Latter-day Saints, the Seventh-day Adventist Church, The Family International, and Wicca, in addition to other NRMs. Vance demonstrates that conclusions drawn from new religions studies shed light on gender and women in religions in general. Each of these volumes is short enough (about 60,000 words) to be assigned along with other texts in a course, and they are in-depth enough to be used as the primary textbook with supplementary assignments in primary and secondary sources. Currently, I am successfully using Vance’s Women in New Religions in my “Women in World Religions” course. As evidenced in oral and written discussions, students readily grasp the implications of Vance’s gender analysis in relation to new religions for women’s roles in mainstream religious traditions as those religions develop from new movements into dominant movements, and as they institutionalize and make decisions concerning the religious leadership and roles of women. Vance’s treatment of new religions demonstrates to students that the gender ideology articulated by a religious movement is affected by its social context. As social understandings of gender change, there is pressure on religious organizations to change their definitions of gender and the roles of women and men. The current diversity of views on gender is prompting religious institutions to take positions concerning their gender ideologies. Scholars of new religions have long stressed that the word “cult” as popularly used is pejorative and dehumanizes believers. Most scholars in new religions studies strive to use neutral and descriptive terms for groups and movements, which are in fact religions. New religions scholars also stress the great diversity of characteristics of alternative religious groups and movements. This always bears emphasizing in the classroom, because of the success of the anticult movement and the media in propagating the “cult” stereotype. The examination of new religions reveals dynamics, issues, analysis, and categories that are relevant to the general study of religions. The study of new and alternative religions is the study of the religions of the world. Cohn, Norman. 1970. The Pursuit of the Millennium: Revolutionary Millenarians and Mystical Anarchists of the Middle Ages. New York, New York: Oxford University Press. Wessinger, Catherine, ed. 2000. Millennialism, Persecution, and Violence: Historical Cases. Syracuse: Syracuse University Press. Wessinger, Catherine, ed. 2011. The Oxford Handbook of Millennialism. New York: Oxford University Press. Wessinger, Catherine, ed. 1993. Women’s Leadership in Marginal Religions: Explorations Outside the Mainstream. Urbana: University of Illinois Press. Catherine Wessinger is Rev. H. James Yamauchi, SJ Professor of the History of Religions at Loyola University New Orleans. She is the author of Annie Besant and Progressive Messianism, 1847–1933 (Edwin Mellen, 1988); editor of Women’s Leadership in Marginal Religions: Explorations Outside the Mainstream (University of Illinois Press, 1993); editor of Religious Institutions and Women’s Leadership: New Roles inside the Mainstream (University of South Carolina Press, 1996). She is author of How the Millennium Comes Violently: From Jonestown to Heaven’s Gate (Seven Bridges, 2000) and editor of Millennialism, Persecution, and Violence: Historical Cases (Syracuse University Press, 2000). She is the editor and coeditor of three Branch Davidian autobiographies. She is the editor of The Oxford Handbook of Millennialism (2011). She is co-general editor of Nova Religio: The Journal of Alternative and Emergent Religions, and she is editor of the Women in Religions series at New York University Press. She has written articles and chapters on women’s religious leadership, new religious movements, millennialism, apocalypse and violence, charismatic leaders, the Branch Davidians, and the “cult” discourse in America. 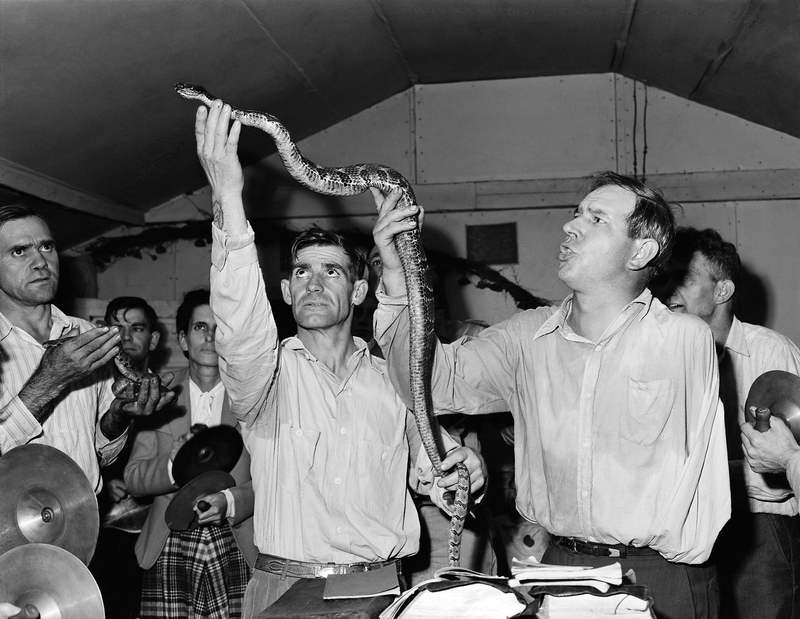 Header Image: Snake handling at Pentecostal Church of God, Lejunior, Harlan County, Kentucky, September 15, 1946 (National Archives and Records Administration ARC Identifier 541335). Photo by Russell Lee. In the Public Domain. Using Memoirs to Learn about NRMs in the "Mini Review Essay"